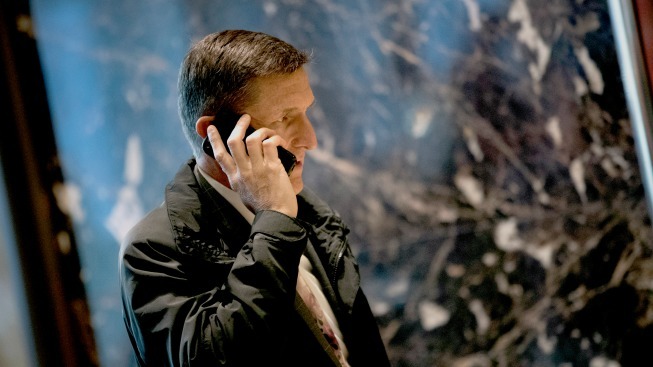 FILE - Retired Lt. Gen. Michael Flynn, then-President-elect Donald Trump's choice for National Security Advisor, arrives at Trump Tower, Jan. 12, 2017 in New York City. A former business associate of Michael Flynn has become a subject of Special Counsel Robert Mueller's investigation for his role in the failure of Flynn's former lobbying firm to disclose its work on behalf of foreign governments, three sources familiar with the investigation told NBC News. Federal investigators are zeroing in on Bijan Kian, a partner at the now-dissolved Flynn Intel Group, and have questioned multiple witnesses in recent weeks about his lobbying work on behalf of Turkey. The grand jury convened for the investigation will soon have a chance to question some of those witnesses, the sources say. Mueller recently indicted former Trump campaign chairman Paul Manafort and his business partner Rick Gates simultaneously. Manafort and Gates have pleaded not guilty. Both Flynn's and Manafort's lobbying firms have come under investigation for failing to disclose lobbying work on behalf of foreign governments.